Support Portal Home » cPanel » How Do I Create a MySQL Database, a User, and Then Delete if Needed? Databases offer a method for managing large amounts of information over the web easily. They are necessary to run many web-based applications such as bulletin boards, content management systems, and online retail shops. This video will show you how effortless it is to create the database and the database user, and assign that user to your new database. This is a standard practice for anyone looking to manually install third party programs that make use of MySQL databases. 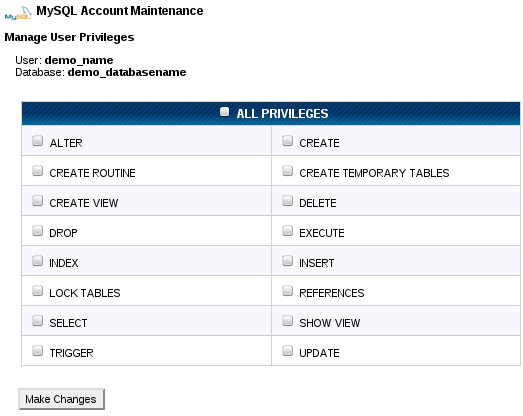 If you would like to remove a user that has been assigned to a database, click the X next to the user on this table. Please see the instructions below on how to assign a database user. 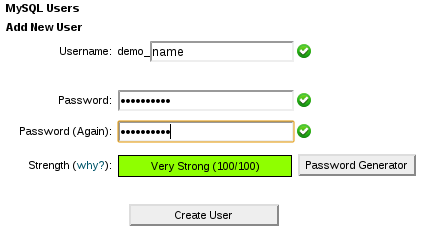 After creating the database, you will need to create a user and assign privileges. Please note that MySQL user accounts must be created separately from mail and web administrator accounts. Click Jump to MySQL Users in the top-right corner of the page. Navigate to the Current Users section of MySQL Databases. In the Delete column, click the X next to the user you wish to delete. Locate the database you wish to modify.